Softening their divergent stand against the enforcement staff of the state excise and taxation department, the Northern Railway authorities have now decided to extend cooperation to the taxation staff to check the nefarious activities of “peti mafia” and curb massive evasion of VAT and other taxes. Gorakh Nath, a 35-year-old man, who had come to the Mini Secretariat to get his licence made, died outside the Suvidha Centre following "suffocation and breathlessness" here at around 11.30 am. 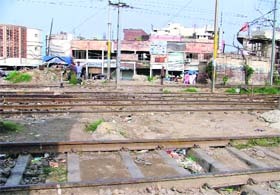 After The Tribune highlighted the poor state of MC Zone A office, the Ludhiana municipal corporation has now decided to set its house "in order" and convert Zone A office located near the Mata Rani Chowk into the headquarters. A case under Section 66-A of the IT Act has been registered against an engineering student, Rahul Sadiora, a resident of Sahibzaada Ajit Singh Nagar for posting "derogatory" comments on the Facebook against Harcharan Singh Golwaria, an Akali Councillor from Ward Number 70. In a horrifying incident, a 21-day-old infant, Dinesh, was rescued by the Government Railway Police (GRP) here today when his parents along with two other men, tried to bury the child near the railway track at Haibowal this afternoon. 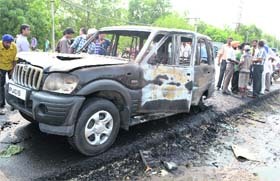 A Scorpio SUV turned to ashes due to sparking in the inner wiring of the vehicle on the Dugri Bridge here today. Car driver Ravinder Kumar (58) came out of the vehicle with the help of commuters after the vehicle got centrally locked following a short circuit. 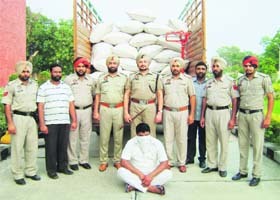 The Jagraon police has recovered a huge quantity of poppy husk from the Sidhwan Bhet area of Ludhiana district and four persons have been arrested involved in smuggling of narcotics. The police recovered 13.30 quintal poppy husk on September 3 and 3.85 quintal poppy husk was recovered on September 2. The value added tax (VAT) rate has increased by 0.5 percent on certain goods from today. Now traders have to shell out more for paying VAT on the items and schedule listed below. Not only this, traders have to get their software updated for filing VAT returns. Ignoring the rising cases of suicide, murder and clash by licensed weapon holders, the police has issued licences to 63 per cent of city residents this year. It also allowed 10 women to purchase the firearms. There is an acute shortage of forms for the post of postal assistant at the post office here. So much is the demand for these forms that about 800 forms vanished within two hours in the morning. Forms have arrived in the city only thrice since the date of filling of forms was announced on August 11. Councillors may not be administered an oath on July 6 as the civic body has not received any communiqué in this regard. The MC officials kept waiting for an official communiqué today. The traffic police has been "trying hard" to maintain law and order in the city. 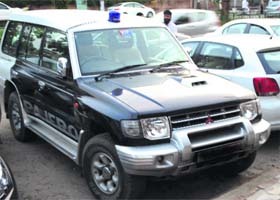 But these strict directions seem to be missing in certain cases as a woman, claiming to be a "close relative" of a DSP serving in some other district, has put a blue beacon atop her Pajero. With the date for the election to the posts of Mayor, Senior Deputy Mayor and Deputy Mayor being announced anytime, the Bharatiya Janta Party today convened a meeting of all its councillors in Chandigarh today. Fountains also called waterfalls are finding spaces in the living rooms of many houses in the city these days. Available in various designs, some have the impression of Lord Budha on them, while others look like rectangular stones. An exhibitor put up Tanjore paintings on display during an exhibition organised in the city. These paintings which are decades old have been procured from palaces in the South. The paintings in different sizes, including large 6ft by 4ft, were exhibited along with other artifacts bearing cultural and religious values. With the prices of gold going through the roof, jewellery showrooms have started wearing a deserted look even though the wedding season is nearing. To attract customers, a majority of jewellers in the city have announced to waive making charges. 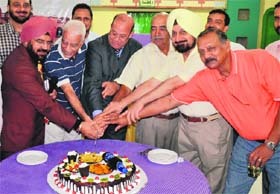 It was an evening to reminisce, re-bond and rejoice for the alumni of St George's College, Mussourie. They got together to reconnect with their school mates. Popularly called Manorites, students of the school, came from all over the state for this get-together. The Marxist Communist Party of India-United (MCPI-U) came down heavily on the Congress-led UPA government, while charging it with pursuing anti-people policies which had created serious problems of price rise, unemployment and rampant corruption. Postage stamp on noted scholar and freedom fighter Husain Ahmad Madani has been launched by the department of posts. Although the stamp is yet to reach the post office in the city, the first day cover has arrived in the head post office. The Central Board of Secondary Education (CBSE) is all set to change the pattern of school examinations from the next academic session. Problem Solving Assessment (PSA) will be introduced for Classes IX and XI to test the reasoning abilities of the students. The board is also mulling to implement the "open book testing" method for Classes X and XII. Some were theatrical, some comical and some tried to portray strong emotions displaying their acting skills in front of a team of director and producers. 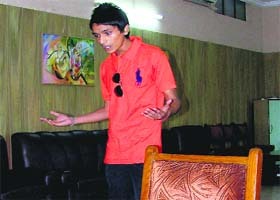 Auditions for the upcoming Punjabi movie, Stupid Seven, were held at Ramgarhia Girls College yesterday. The college road of Doraha is in a miserable state. Daily commuters including school and college students and bank employees have no other option but to take this route. A 43-member delegation of Indian Doctors for Peace and Development (IDPD) returned after participating in the 20th World Congress of International Physicians for the Prevention of Nuclear War (IPPNW), organised by the Japanese Physicians for the Prevention of Nuclear War (JPPNW) at Hiroshima, Japan, from August 22-26. Charanjit Singh Atwal, Speaker of Punjab Vidhan Sabha, disbursed cheques worth Rs 60 lakh among three blocks -- Khanna, Doraha and Dehlon -- at Dr Ishwar Singh Memorial Hall of Guru Nanak National College, here today. To mark the National Nutrition Week, an interactive session on malnutrition was organised at Saraswati Model Senior Secondary School. Dr Pallavi Aggarwal, a city-based nutritionist, apprised the students of the nutritional value of various kinds of fruits and vegetables. State-run BSNL is all set for infrastructural changes to increase bandwidth in the city. Senior general manager, CS Bhanot, said, the present infrastructure will be replaced with a new technology and BSNL will increase bandwidth for the 3G services to three times to speed up the data transfer process. A milkman was injured in an accident when an over-speeding government vehicle hit his motorcycle near Kali Mata Mandir on Hambran road today morning. According to eyewitnesses, the vehicle hit the milkman, Harjeet Singh, a resident of Hambran village, from the rear side. He was admitted to a private hospital. A 25-year-old migrant worker was found murdered in the PUDA ground opposite Vardhaman Factory yesterday night. The deceased, Qurbaan, reportedly had a scuffle with some unidentified persons who later killed him, the police said.